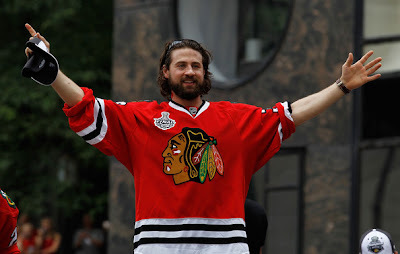 Moments after the Chicago Blackhawks had defeated the Flyers in the 2010 Cup Final, a NBC reporter tracked down one of the more colorful characters on the Hawks, Adam Burish to ask him to divulge his true feelings regarding Chicago's new public enemy Chris Pronger. Unless you are a Flyers fan, it made for great tv; and it certainly opened a floodgate of discussion. Amber: What's the significance of February 5th? Burish: February 5th. I have no idea. Amber: Alright, well let me tell you. It's your first game against the Flyers and Mr. Chris Pronger. How would you characterize your relationship with Chris Pronger at this point? Burish: You know what, I said some stupid things I probably shouldn't have after that game. It was just a spur of the moment thing and I'm not gonna sit and make an excuse about it because what's said was said. I've got a lot of respect for the guy. I think he's a Hall of Fame defenseman, one of the best that's ever played the game. Probably one of the hardest d-men to play against. He does everything well. I really, truthfully didn't mean anything personal by it. It came out personal but it shouldn't have been said. I was embarrassed about it. I got a lot of respect for the guy and that team is so dangerous. They will be again this year. It was a heck of a series, it was a heck of a Final. Whatever happens moving forward happens but for me, I don't try to mean anything personal by it. It was a spur of the moment kind of thing. Burish: I've moved on and hopefully, I'm sure they have too. I'm don't think a guy like Chris Pronger, a Hall of Fame d-man, is really too worried about a guy like me has to say at the end of the day. So Burish stated that he regretted what he said, then went on to establish Pronger's credentials, etc... Why? Burish was so "embarrassed" by his own, not-so-off-the-mark comments, that he had to practice Pronger's HOF presenters speech? Come on! Burish should have felt perfectly within reason for his remarks. He should have hated Pronger. The guy who stole the game winner pucks from Burish's teammates in the first two games of the Cup Final. So what if Burish was a "black ace" for the Cup clincher? Any spectator could assess that Pronger was indeed "terrible" in the games that Philly lost. What was he? A minus-bazillion in those loses? Does anyone think that Pronger will apologize for his comments about Burish? We have never been impressed with Pronger's "leadership" tactics and media manipulation. However, we will freely admit that Burish was correct in his "...Probably one of the hardest d-men to play against. He does everything well..." remarks/apology. Regardless of his success, Pronger's skill and grit has always been marred, and to a degree, overshadowed by, cheap shots and distasteful behavior. Which, when his career comes to a close, should land Pronger somewhere between Dino Ciccarelli and Chris Simon in the NHL's pantheon. By design, Pronger is a divisive character. Burish is doubtlessly not the only guy in the league to express a dislike for the guy. Pronger is also entering the twilight of his career. After 16+ seasons on NHL punishment, guys, regardless of how talented they might be, are going to have some bad games. After the shenanigans and verbal sparring of the Finals, Chicago players were entitled to think Pronger a big "idiot". After some poor games, they were entitled to call his play "terrible". It's part of competitive sports. It's part of a game of aggression.What was so wrong with Burish's verbal jabs? We say Burish did the wrong thing by trying to do the right thing. Of course it don't feel right! What has felt right for you doesn't work! You need to try some wrong, dawg! I have to admit that they always have something interesting to say against each other. and Host PPH has been following their conversation out.